In a most recent acquire of Korean cosmetics, this angels have really been a blessing to me. Thank you HKC Plaza for the generous sponsorship of these cosmetics for The Dancing Jewel's shoot. HKC Plaza manages 38 brands with more than 6000 products, transcending from professional skin aesthetics to back-end clinic salon usage packages. First up is one of it's most popular range, Lee Jiham's Vital CC cream. This natural blemish cream contains 800x more vitamin C than apples and provides brightening effects. Apart from the Acacia collagen, it also has whitening and wrinkle diminishing properties. In the past, I always get tempted to skip the makeup removal step at the end of the day as my Biore make up wipe would always appear "clean". But upon using LJH's vital cc cream, my biore make up wipes are now fully worked out. It cleans off the cc cream that has been adhering to my face, which further proves that this cc cream provides ample coverage for me. This formula is the brainchild of more than 20 years of research in LeeJiHam Science Research Dermatological laboratory. Another special property that distinguishes LJH vital cc cream from the other brands is that it contains Centella Asiatica which has great scar treatment properties! This Sun pact is new in the market and will be launching up in their stores next week! Another one of my favourite products has to be their Real Life Innate line eyebrow pencil. With the dark brown shade and angular pencil, this baby glides over the brows effortletless and easily creates a natural look, as if the eyebrows has been tattooed on. While I was still in corporate last year, my colleagues often said my brows were too light and I should have them tattooed. Of course been fearful of pain, I simply refused to do so. I've tried other brands of eyebrow pencils and thought it didn't make much difference to my brows. This only changed when I was given the chance to try out the Real life eyebrow pencil. And now, I can't leave my house without having my brows drawn. At the party vivid line pen eyeliner, this has to be the sleekest and slimmest eye liner brush that I've seen. Can't help but be reminded of those elegant calligraphy brushes. With it's thin and elastic fine brush tip, this brush fills up the delicate portions between the eyelashes and eyelids, which often poses a problem when the eyeliner is too thick and you end up getting blacks even on the inner eyelids. 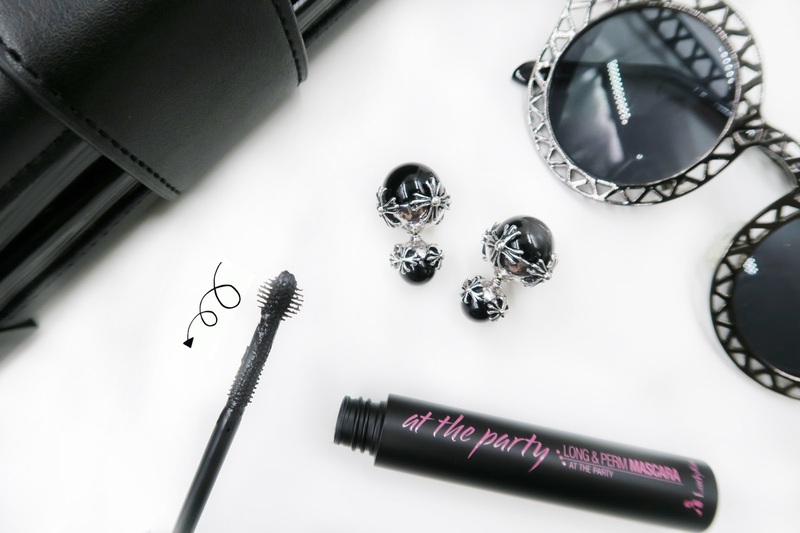 Another of my must-haves has to be the At the party Long & Perm mascara. I have always been envious of girls who have natural long lashes, or even those who can have eyelash extensions or falsies on for the whole day! It certainly weighs down on me and I usually can't have falsies for more than a night. Spot the tiny bristles even on the inner portion of the brush? The design cleverly allows you to elongate the lash tips while working on the inner lashes with it's round circular front. And the best part is, it removes easily until warm water! I've always dreaded applying mascara on because it clamps up so much and takes me soo soo long to remove it after the end of the night. This is definitely a saver, not forgetting that the bf doesn't like me with falsies as they are too fake! I think this pass the mark! And yes, now for the lippie lovers, these are my 2 favourite shades out from their massive collection. These One Touch Lip Glow lipstick has to be favourites. I've always been a fan of stylenanda after my Korea trip and I simply can't lay my hands off a bright orange lipstick. But there's always the pain that they get faded so easily and I'll have to reapply them now and then. I have to admit that I'm honestly impressed by the adhesive power of this range of lipsticks, especially the bright orange #11 Miss Solar which creates a deep enough contrast for my lips. On days for easier matching of outfits, I would opt for the #3 Strawberry shade which gives the lip a demure elegant touch, playing with nudes and blushes. Should the One Touch Lip Glow not be enough, don't miss their exclusive Some Lip Tattoo! No more worries for long days or party nights. With these lip tattoos, your lip colour will still be in the perfect state even after eating or drinking. For TDJ shoppers, HKC has very kindly sponsored us these Vital CC cream and Vita Propolis ampoules and cream sample packs. The Vita Propolis ampoule is so special as it uses the best quality pure porpolis extract and 3 kinds of vitamins all concentrated into one formula. Spend a minimum of $50 at The Dancing Jewels to get both sample packs! You get to determine TDJ collection! TDJ Captures: Vintage and vacations.